Is there a thread for which wheels? really looking to see if there's a thread to see what wheels your all running on Mk7.5's? have been looking at pretorias but they weren't OEM has anyone or could anyone recommend a vendor? but not wanting to mortgage me house for a set of wheels. getting delivery of a new GTI Performance 1st March but sadly on the basic wheels hence looking to upgrade. Re: Is there a thread for which wheels? If was changing mine, I'd be tempted by the Borbet FF1. Very OEM looking and super-light. Well priced in 18s but expensive in 19s (forged). While I like to chip in with my point of view... I am staying out of this thread! Over to you guys. Brescia alloys on mine, I would choose the same again. I've swapped from standard on the GTI PP 7.5 to a set of 18" Black Pretorias. Looks great with Atlantic Blue IMHO. 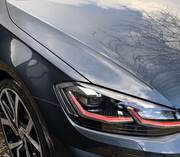 You can get genuine 18" Prets from VW, and the site on ebay I got mine from was good value, and from a main dealer with VW warranty / TUV paperwork etc. I prefer the ride of 18s. GTI PP 245; Atlantic Blue, Art Velours, Climate windscreen, KSS, genuine 18" Black Pretoria. Bet they look good. You should get some pics up. VWR Cup Edition 18” on mine for summer, Ronal R46 17” for winter. Both have type approval for the Golf. Was reading an article in one of the VW/Audi mags while I was waiting for my tyres to be fitted the other day and they were saying that putting larger wheels (with lower profile tyres to keep the same rolling radius) on a car can actually make the car look taller than it was before. Their basic premise was to make sure the arch gap was the same size (or smaller) than the height of the sidewall - therefore if you fit lower profile tyres you should lower the car too - although only by half an inch each inch of wheel size you go up.